A young lawyer is sent to a remote English village to tend with some unfinished paperwork, once in the town the lawyer finds himself face to face with a unforgiving ghost who plagues the town. "The Woman in Black" is a period horror that is at its best when it is setting the mood and providing a few jumps. One thing that immediately grabbed me within this vengeful ghost tale is the set and costume design. Both of which are stellar at helping to create the mood. Everything within the film is elegant, yet murky and grey giving off a classic eerie vibe. Even though they are not in any way connected, this movie felt like what Disney's Haunted Mansion should have looked like. A good old fashion ghost story with a really spooky house you should be weary about entering. While "The Woman in Black" houses a number of quality jump scares, it never becomes a scary movie. There is tension that is being teased and pushed but it never fully resonates. Everything comes across safe even if the script is telling the audience otherwise. Ultimately, I never felt myself pulled into the story and was always one step ahead. A lot of this happens to rest in circumstance. The Woman in Black is another horror in the long line of revenge ghost stories. You probably thought Hollywood was done with them after the last wave of paranormal movies that followed The Ring and The Grudge but with Paranormal Activity having whopping success at the box office, audiences are sure to see another large helping of disgruntled ghost stories in the years to follow. Back to 'Woman,' the audience is slowly made privy to the backstory of what happened to this particular unforgiving spirit. Much like the other antagonistic ghosts, our main character tries to appease the wounded soul hoping it will find a true resting place. Following the path to appeasement is suspenseful to a point, but having been down this path so many times prior with other movies ends up taking away most of the thrill. There are quite a few good jump scares throughout the horror, yet oddly enough Daniel Radcliffe never seems phased. The actor is so straight-faced throughout I wondered if he would ever get spooked. There is one moment in particular early on when Arthur Kipps (Radclife) sees the ghost in a window of the house while outside. Kipps hardly bats an eye at this reveal and I couldn't help but call foul. Seeing a ghost in a window for the first time you would think that person would fall down, or even do a double take. Kipps character is revealed to have some spiritual backstory but you'd think there would have to be some alarm when seeing a dark spirit, instead he goes running toward the ghost without any fear whatsoever. There is a level of disbelief that can be argued here as well, but at some point I expected the character to actually get scared. This isn't to say Daniel Radcliffe doesn't deliver a capable performance, because he does. Radcliffe conveys a strong performance as Arthur Kipps. He carries the film on his shoulders and is able to pull a majority of the weight in between scares. Ciarán Hinds nails an engaging portrayal of a local member in the remote English village trying to ignore the ongoing paranormal activities. I loved the fatherly role Hinds played to Radcliffe's character Kipps. It was a nice touch in an story that was otherwise mainly focused on crafty jump scares. It should also be noted that the entire cast of townsfolk do a polished job of adding authenticity to the mystery within "The Woman in Black." The high points in "The Woman in Black" are indeed the scares and the ghost. The build towards the reveal of the woman in black works. The presence of the woman in black throughout the horror ends up being my favorite aspect in the ghost story. Each time she is on screen or eluding to being on screen there is an eerie mood that persists. It never manages to crawl under your skin, but it is the right combination of creepy and fun that makes for a hair-rising experience. The audience gets plenty of small hints along the way bringing to attention tension the horror is building toward a jump. Much like riding a roller coaster, riders begin to anticipate the turns and drops, the audience can sense the scares coming in The Woman in Black but that doesn't deter from the enjoyment. This is a call back to classic horror, there is no gruesome slashing or gross-out techniques at play, just simple jump scares working off shadow play, creepy imagery, and old creaks within a haunted house. 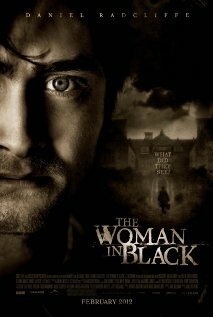 Overall, I thoroughly enjoyed the scares and set design within "The Woman in Black" though I never found myself completely attached to the story. Not the ghost story or what led to the angered spirit, because I actually found that backstory engaging, but the side arc to Arthur Kipps character. Kipps is a bore and how his backstory will tie-into the overall story is immediately too obvious. Despite a lack of fulfillment from the main character's arc and an overly basic vengeful haunting, I enjoyed this re-telling of Susan Hill's horror novel and would recommend it to any fan of the horror genre.